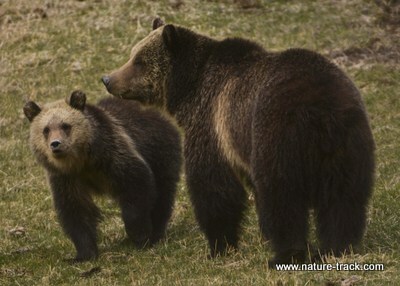 A sow grizzly and her cub were the crown jewels of a quick visit to Yellowstone. Despite Saturday’s forecast of almost guaranteed unsettled weather, I headed to Yellowstone Friday night. My schedule was full for the next four consecutive weekends, pretty much eliminating another pre-season trip. I drove through almost steady rain and snow from Ashton to Mammoth and steeled myself for a cold wet camp. But when I pulled into Yellowstone’s Mammoth campground, open year-round and the only campground open before May, I found the Campground Full sign at the entrance. With no options, I headed for our old standby, the Yellowstone Motel in Gardiner. This shoestring trip just got expensive but it was nice to have someplace warm and dry to sleep. By 5:20 a.m. I was on the road, headed toward the Lamar Valley. I planned to just cruise up and down the road and look for wildlife. If the weather cooperated better than expected, I might take a short hike to Trout Lake. By Tower Junction I had already seen dozens of elk, hundreds of bison, including three brand new calves, several groups of mule deer, bighorn sheep and pronghorn antelope. It was an auspicious beginning for a gloomy weather day. As I drove slowly up the valley, I scanned for grizzlies and wolves. April seems to be a good month to find both of these in Lamar Valley but despite several passes from the Yellowstone River Bridge to well past Pebble Creek, I couldn’t find any to look at, much less photograph. I stopped to glass and eat breakfast at the Lamar work station when someone tapped on my window. “Did you see the wolf?” he asked. Sheepishly, and with a mouth half full, I said, “Uh, what wolf?” He invited me to look through his spotting scope at a wolf nearly half a mile away. Then he pointed out two dots about a mile away in the opposite direction and assured me that they were grizzlies. Through my own scope I confirmed he was right. Technically, I had fulfilled the object of my trip, but what I really wanted was to photograph them and that required a much closer encounter. Rain and snow squalls pelted the valley for most of the day. Each time I gathered courage to brave the elements and take a walk, rain would begin to dance on the roof of the truck or snow would obscure the windshield and dampen my resolve. After several more uneventful passes through the valley, I gave up and decided to try my luck elsewhere. Several miles south of Gibbon Meadows, the day came together in a grand fashion. On the far side of the Gibbon River, a sow grizzly and her yearling cub worked along the bank. They grazed, dug for insects and earthworms and posed beautifully.